“We could see the random disappearance of products and well-known brands from shelves because supply has been interrupted,” Ian Wright, the CEO of the UK Food and Drink Federation, told CNN. Wright says it’s important that food retailers are prepared, but it’s not yet time for shoppers to start hoarding supplies. But many British businesses, as well as consumers, have already begun stockpiling in anticipation of the UK crashing out of the EU, a move that could trigger a sudden imposition of customs barriers and costly trade tariffs on goods traveling between Britain and its biggest trading partner. That’s led companies like Premier Foods, a major British food manufacturer that makes everything from custard to stock cubes, to increase supplies of ingredients, according to Reuters. Two of Britain’s biggest supermarket chains, Tesco and Marks & Spencer, have also announced that they are also boosting stockholdings of non-perishable foods. “Nestle have said that they are ensuring a continued supply of ingredients, we’ve also heard that from Ferrero, and from a number of British companies who only operate in the UK, but whose products included important ingredients from Europe,” Wright said. And as businesses bulk up, warehouse space is dwindling. Describing the situation as a “perfect storm,” the UK Warehousing Association said in a statement that a straw poll of its members indicated that 75% of warehouse space was already full. Fears of supermarket shelves laid bare have led some British citizens to start stockpiling themselves as the Brexit deadline approaches. Facebook group 48% Preppers, which offers advice for “practical preparations” for “life after Brexit,” has accumulated nearly 7,000 members. Blogs abound with suggestions on what to put on your Brexit shopping list: preserved foods, medicine and baby essentials are most common. 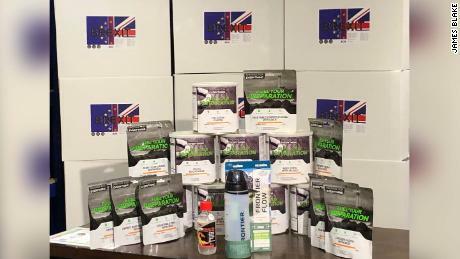 One company is selling concerned Brits “Brexit Boxes,” which sell for just a little over $380, and include freeze dried food with a 25-year shelf life. Another “Deluxe Brexit Box,” retailing at $775, is described as “a great start to help you overcome Brexit worries of no food in the shops” with 157 meal portions. 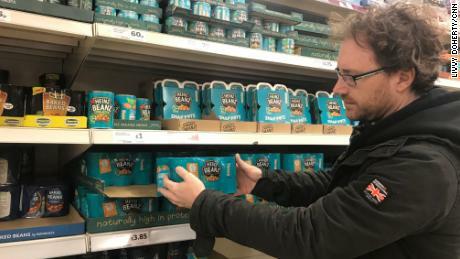 Graham Hughes, a travel writer who lives with his partner and two children in northeast England, has been buying food for months for his family. The biggest problem, he says, will be fresh fruit and vegetables, something you can’t stockpile. He’s largely bought canned and dried foods to supplement meals: tinned tuna, cans of chicken soup, noodles, rice and a lot of baked beans. “It’s about making sure the kids don’t go hungry, that they don’t go without a meal, and making sure there is always going to be food there,” Hughes said. 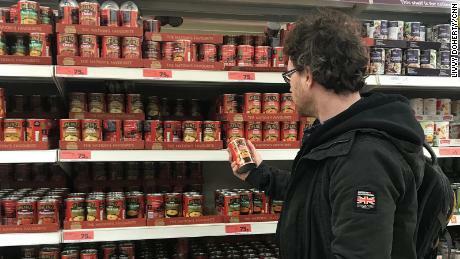 The cans of Heinz Baked Beans he buys — a British staple — are produced in the UK, but the raw haricot beans and tomatoes inside are imported from North America and Southern Europe, respectively, both of which Britain currently trades with via the EU’s single market. Until the UK makes its own deals, the beans and tomatoes could be subjected to higher tariffs. That, paired with issues of customs procedures holding up products and trucks at the border, have led Brits like Hughes to prepare for the worst. But they’re still a minority. “I think most people are thinking it’s going to be fine because they’ve never had the experience of being in a country where things have gone horribly wrong, where supply chains have been disrupted,” Hughes said, giving the examples of Venezuela and Zimbabwe. CNN’s Martin Goillandeau, Livvy Doherty, and Eliza Mackintosh contributed to this report.